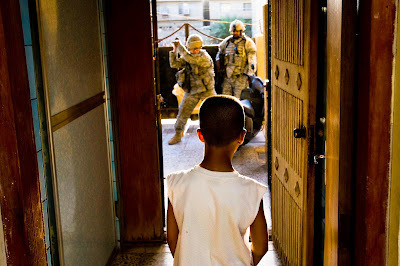 The way I read the Miller embed photograph we have a young Iraqi observing two US soldiers in the next room. One of the soldiers has arms raised above his shoulders as if he has lifted something and is about to strike an object before him. Just ahead of him there appears to be a motor bike or scooter. The second soldier looks on as the first prepares to act. Question: If my reading is correct, what military purpose is being served by an attempt to strike or damage the private transportation of an Iraqi citizen. Is this not just vandalism? Perhaps once we get this sorted out we can move on to the larger question of significant birth defects amoung newborn in Falluja due to the US miltary use of depleted uranium weapons and then perhaps we can proceed to questions over why it is that no offcial government authority is even attempting to count the total number of deaths associated with this conflict and perhaps once we answer those questions we can begin to study the legal basis for the conflict and the much greater question of who bears culpabilty. After Nuremberg the German people were rebuked by the peoples of the world for taking no action against their government for its heinious actions. Should the world not so rebuke the American people?